Malawi will have the opportunity to buy 200 megawatts (MW) of power from the Southern Africa Power Pool (Sapp) once the $127 million (about K94 billion) power interconnection project with Mozambique materialises by 2022. 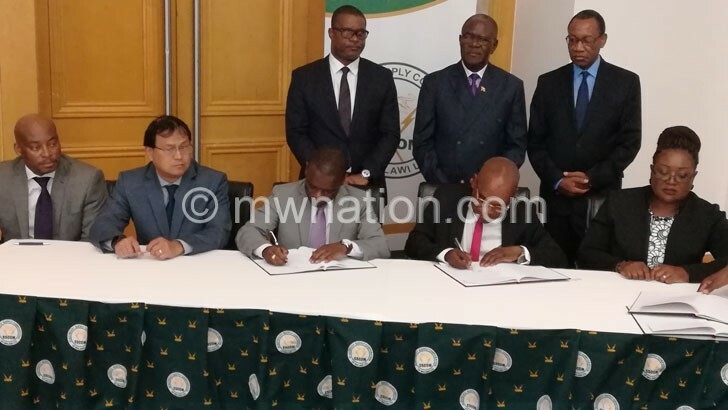 Minister of Natural Resources, Energy and Mining Aggrey Masi said this yesterday in Lilongwe after signing five project agreements between Electricity Supply Corporation of Malawi and Electricidade De Mocambique (E. P. EDM) with his counterpart from Mozambique, Ernesto Tonela. Mozambique Minister of Mineral Resources and Energy Ernesto Tonela said his country is happy to have finally seen the project coming to fruition after a long period of negotiations. ““The project will ensure Mozambique exports power to Malawi and in future Malawi will also be able to export power to the region after having the surplus,” he said. Escom chief executive officer Allexon Chiwaya, on his part, said the cost of the project as determined by the feasibility study for the double circuit line is $127 million (about K94 billion). He said out of the amount, $92 million (about K68 billion) will be spent on the Mozambique side with the remaining $35 million (about K26 billion) on the Malawi side. He said the project entails that the wheeling agreement unlike most standard agreements, Escom will be paying EDM for the full cost of investment for the Mozambique portion of the line. Through the arrangement, any party that wants to wheel power through the line, including EDM, will pay compensation to offset the full cost that Escom will have been paying for the line.